The clear, aquamarine water of North Creek has scooped a tunnel-like slot canyon out of Zion’s sandstone. This particular section of the canyon is referred to as the Lower Subway by hikers and canyoneers. Northwest of the Zion visitor center, a small stream slices through the Zion backcountry. Like many of the creeks in Zion, its water is the color of pure aquamarine. The water almost glows where it pools against white sandstone bedrock. 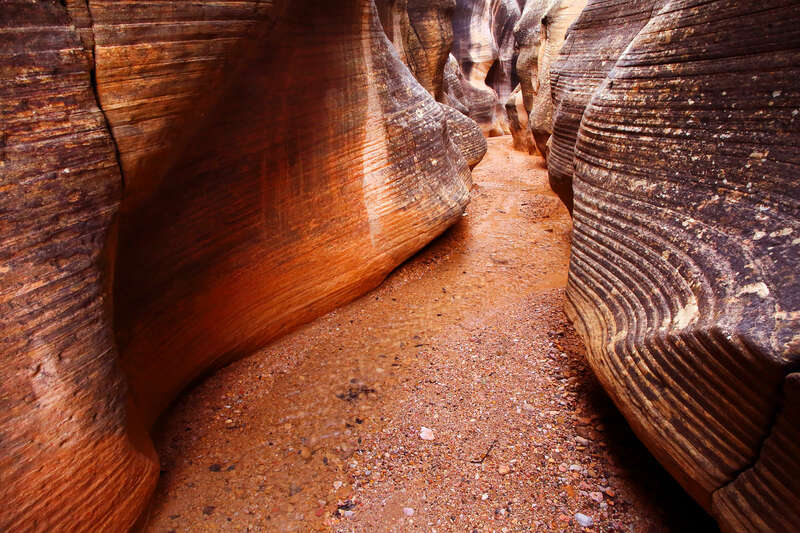 The left fork of North Creek has carved a twisting path through Zion’s ancient and petrified sand dunes. 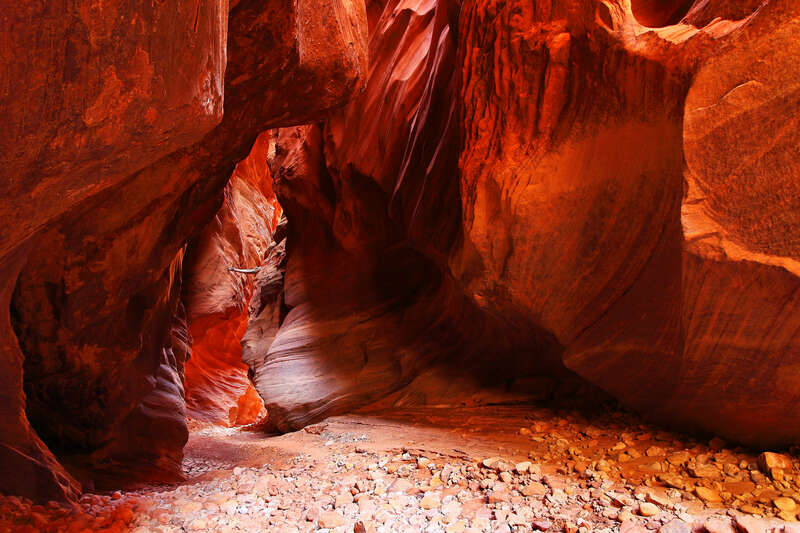 The route is often referred to as “the Subway,” a name it gets from a rounded, hollowed out segment of slot canyon that undercuts the rock above. The Subway’s large, tunnel-like features certainly emulate its namesake, though in a much more elegant manner. The route is popular for a reason: it serves up an amazing variety of scenery for the distance traversed. The Subway is not specifically marked on maps. It is a quarter-mile segment of the canyon located almost precisely between two peaks called the North and South Guardian Angels. Getting there involves a long traverse of sandstone slickrock, followed by a steep descent to the canyon bottom. The route then follows the twists and turns of the river bottom until the canyon widens again. After dropping over a short drop called Keyhole Falls, the river enters the upper Subway. The canyon walls begin to close overhead, leaving hikers to feel as though they’re entering subterranean passageways. After descending a short, sloped cliff, the lower Subway delivers one last segment of exceptionally large, round tunnel. 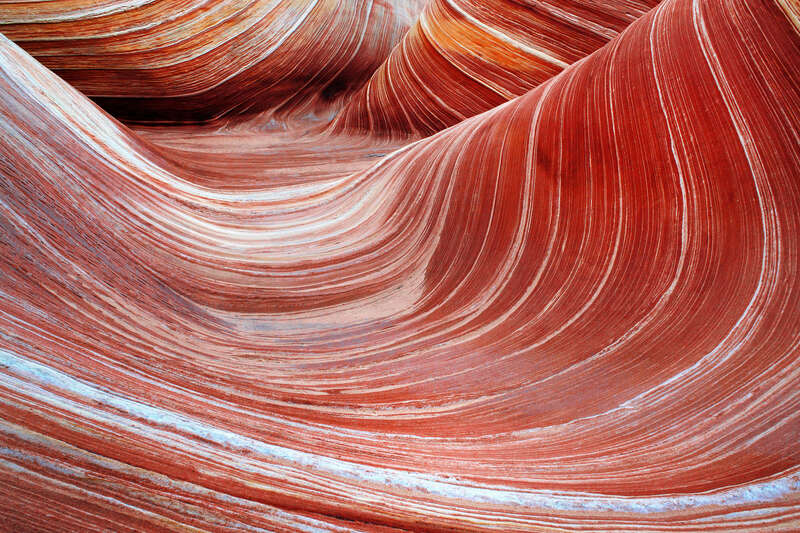 The azure water swirls over potholes and beautiful twisted sandstone before exiting. The route continues down-canyon through still beautiful, but less otherworldly terrain. Don’t worry; there are plenty more waterfalls to be seen, including a long series of cascades that drop over miniature sandstone terraces. About a mile and a half past the subway, vigilant hikers may spot an angled slab of mudstone peppered with dinosaur tracks. The Subway is a demanding, six to eight hour hike. The approach trail follows relatively easy terrain, but straying to either side may land you in a difficult predicament. The canyon bottom is only safely and easily accessible at a few specific points. They’re easy to miss, so use caution when descending to the canyon floor. Once you’re in, just follow the water. There are a few short drops and mandatory swims through narrow, deep pools. Water cascades over a ledge along the Left Fork of North Creek. The Left Fork of North Creek runs down a broad sandstone floor that looks like a spillway. Carved naturally from the sandstone, it’s riddled with cracks and terraces. Here, a small rivulet accelerates downhill along a fissure. The route is not extremely technical, but for most people rope is a must. Some hikers simply use their rope as a hand line, while others bring rappelling gear. The few spots that require rope-work have already been bolted and anchored, making it easy to slip your rope through and move on. The full-length hike begins at the Wildcat Canyon Trailhead on Kolob Reservoir Road. Most parties bring two cars and park one at the Left Fork Trailhead where the trail ends. Hikers who just want to visit the lower portion of the subway can do so without a rope or having to get wet. To do so, simply start from the Left Fork Trailhead, follow the trail into the canyon bottom, and head upstream as far as possible, which is the cliff band between the lower and upper subway. The Left Fork of North Creek cascades over hundreds of miniature sandstone terraces, just downstream from the Lower Subway. Visiting requires a permit, which can be difficult to obtain due to popularity of the route. Currently 80 people are allowed to enter the canyon each day. The bulk of those slots are filled by lottery, which you can enter online. About 20 slots are reserved for walk-in permits, which can be obtained in-person at the Backcountry Window, one day prior to the planned hike date.